AVAILABILITY AUGUST 28 - SEPTEMBER 9 @ €720 Weekly / €103 Nightly. 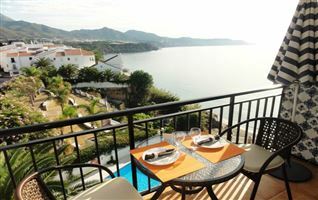 A newly refurbished sunny 2 bedroom apartment (**Occupancy is 4 persons**), with large 35M2 private terrace with panoramic views over the Andalucian style village urbansiation of San Juan de Capistrano, to Nerja and the sea. Sun all day! Access to shared pools, ( open from Easter until the end of October with a life guard ) restaurants and bars within easy walking distance. AC operated on a 'pay as you go' basis. A quiet retreat with stunning views, yet close to all amenities. WIFI included in the rental price. 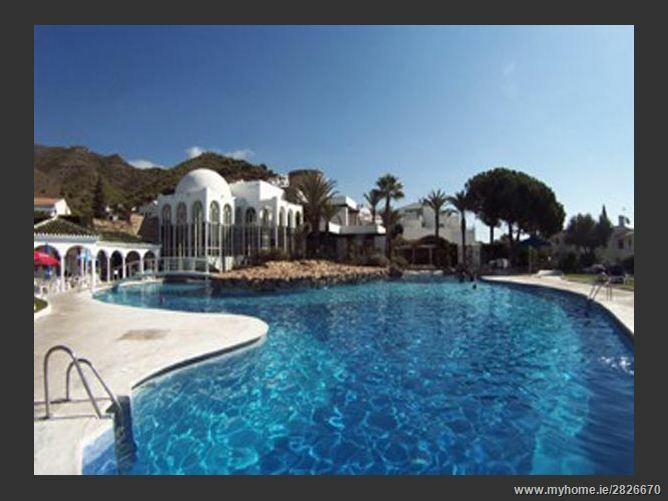 The well known Urbanisation of San Juan de Capistrano is located in an elevated area of Nerja. 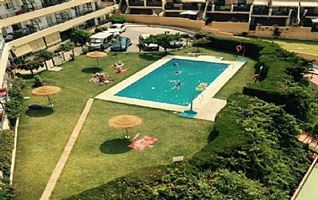 Set in walkways and beautiful gardens with tropical flowers this pretty area of Nerja has a lot to offer. The town bus stop is a couple of minutes walk away, although the urbanisation offers communal pools, bars, restaurants and even a small shop. The apartment itself is accessed via a number of steps and is therefore not suitable for people with walking difficulties. Once your reach the property, you will be impressed by the fantastic terrace and the bright modern decor of the apartment. The lounge has large 'fold away' doors, integrating the inside and outside seamlessly. Two good sized bedrooms, one of which has a double door opening onto the terrace with its comfortable outside lounge furniture, sun loungers and tables and chairs. The kitchen is modern and of an open plan design. A modern shower room with a large walk in shower. Leather sofa, two armchairs, glass coffee table, side board with large flat screen TV (TV channels listed below) DVD, dining table and four chairs, 'fold away' doors provide access to the large terrace with stunning views. Fully equipped newly installed kitchen with large fridge / freezer, electric hob and oven, extractor fan, dishwasher, mircrowave, kettle, toaster, coffee machine and a large choice of crockery and dishes, a breakfast bar with ample work space, AC unit. Double bed with bedside tables, wall mounted reading lights, chest of drawers, full length mirror, built in wardrobe, AC unit, double doors to the terrace. Twin beds with bedside table, wall mounted reading lights, chest of drawers, full length mirror, built in wardrobe, AC unit. Modern sink unit with drawers, mirror, WC and large walk in shower with glass shower screen, hair dryer. 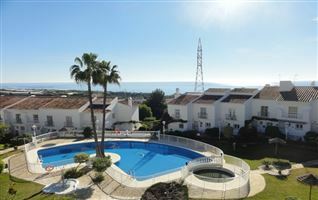 Two communal pool, with pool bars and restaurant are a couple of minutes walk away. 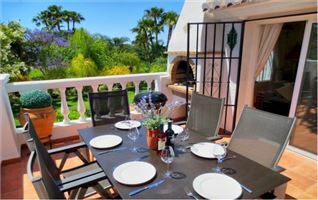 The terrace with its breath taking views, comprises of a L-shape outside sofa, low level table, two sun loungers, outside garden table and four chairs. A part of the terrace has a roof, providing shade for those not wishing to eat in direct sun shine.